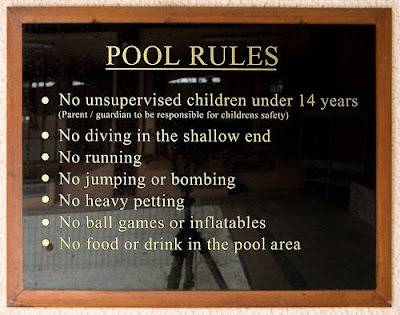 Everyone knows the usual swimming pool rules. Most are like in the picture below. And yes, most people blatantly ignore the rules and the teenage lifeguard who is generally asleep doesn't seem too bothered enforcing them. As such it was pretty funny when hearing an account by Tony Hawks (a British comedian and author not to be confused with the world famous skateboarder) who had recently purchased a house in the French Pyrenees. He decided that a swim at the local pool would be a good idea while waiting for the hole in the garden of his new home to be finished into a pool. Upon entering the pool from the locker rooms, resplendent in brand new swimming "bermuda" shorts, he noticed that the two lifeguards were obviously worried about tan lines and were promoting the traditional European "Speedo" look. Just as he was about to dive in, two lifeguards ran over shouting "Arrêtez! "....ok, so perhaps the signs say "No Diving" and he begun to just climb into the pool. Still more "Arrêtez!,Arrêtez!" from the two lifeguards.....they then finally begun to explain that "Bermuda" shorts were not allowed in the pool and only the use of "trunks" was allowed. Tony was escorted from the pool area and told that he would only be allowed to swim when he returned with trunks and not the long-baggy, non-European shorts that he was wearing.